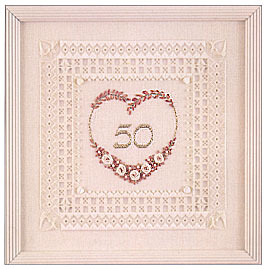 Some years ago, I designed a square 50th Anniversary Sampler for a needlework magazine. At that time, I determined that I would eventually expand that design to make it more challenging, and publish both versions in one leaflet. So here you are! Long and elegant, this sampler can hang on any wall and still look beautiful.. I've used antique colours and tones so that the overall effect is classic and timeless. Mauve, rose, taupe, and ivory silks on a platinum linen, with silver/gold metallic touches, and the sparkle of hundreds of ivory, old rose, and violet beads combine to create a rich memory of years of love. The verse, "Take my hand and walk with me, The best in life is yet to be.." is slightly changed from the original, but keeps the spirit of true love and commitment. At the back of the leaflet is the original design, stitched on ecru linen, with slightly different colours for the silk ribbon heart, and bullion knots for the roses.. The Hardanger frame for the square sampler can be lengthened to fit around the long sampler if you wish! Suitable for anniversaries, weddings, graduations, or birthdays, you can change the colours of the fibres or the fabric, and the wording, to stitch this sampler for the celebrations of the special people in your life! I hope you enjoy stitching this heirloom! On the front cover photo, we've shown the long version of the Heirloom Anniversary Sampler. On the back cover, you'll see the square version. You may wish to use the Hardanger Frame from the smaller piece, extend it, and stitch it around the long version for added impact! However, you will have to make sure you have enough fabric to do this! You will need to add another 3" to each side of the long sampler.